With the WWA's 9th pick in this draft we choose a former JWP Junior Champion - Arisa Nakajima! 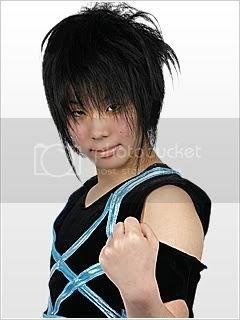 And again the WWA gets to pick, and for their 10th pick, we chose a former TWF Tag Team and JWP Tag Team champion - Sachie Abe! And with the WWA's 11th pick, we chose someone we seriously hope doesn't get hurt AGAIN - Nagisa Nozaki! And with the WWA's 12th pick in the draft we chose a former TLW Tag Team Champion - Moeka Haruhi! Thanks Rocky. I am back. Much appreciated. I will try to update the master lists, etc. Just in time too I guess. I have to step away for a few hours & asked globalhonored to pick for me. With that said, the WWA's next pick, the 13th in this draft is none other than the newest member of Black Dahlia, Cherry! For WJP's 13th draftee, is a former JWP Openweight and Tag Team Champion, and has recently held the ICEx60 Championship. They are also the current owner of JWP. And for the 14th member of WJP, is a former Jd' Star Junior Champion and a JWP Tag Team champion. She also fights in MMA. And now for the WWA's 14th pick in this draft, we go with someone who is a part of the young generation - Hanako Nakamori!